Paul Elias likes to fish on Pickwick Lake when fog is rising off the water just at daylight because he knows he’ll have a busy day catching numbers of a wide variety of fish. I love to go to Pickwick Lake in December. My rod stays bent and I catch nice-sized largemouths, big smallmouths, white bass, stripers and hybrids all in the same day. I like to fish an Alabama rig there for actively feeding bass. You never know what you’ll catch with it: those fish already named, as well as sometimes big drum when fishing near the dam. • The Lock, the Lock walls, the barge tie-up and riprap. I’ll start by fishing the lower end of the lake, along the riprap, down near Wilson Dam, with 65-pound bass braid and an Alabama rig on a 7-foot-6, heavy action Shimano rod with a Curado 200K reel. 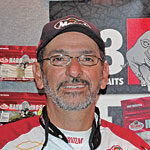 The Alabama rig, featuring several ¼-ounce jigheads with a Mann’s white Reel ‘N Shad on each, resembles a school of shad. 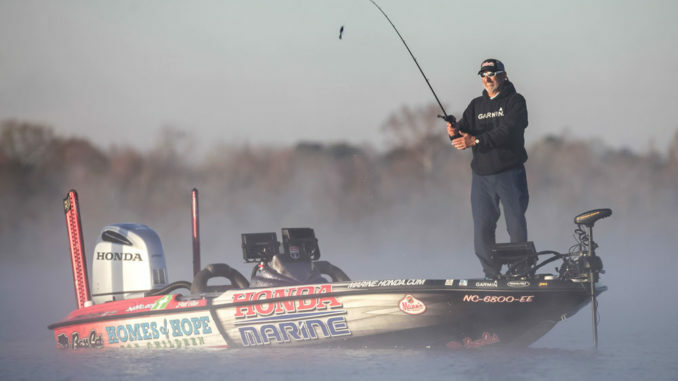 The bass will come up from 20 to 30 feet to strike an Alabama rig. I’ll fish the rig around the lock and down its walls, the barge tie-up and the riprap. In December, I’ll usually catch some suspended bass around the corners of the lock wall where the riprap touches the dam’s concrete wall. I’ll cast this rig out at a 45-degree angle, count it down to a five-count to let the rig run 10 to 15 feet deep, and slow-reel the rig back to my boat. As I fish down the riprap, I’ll locate several schools of bass on about 25 to 30 yards of that bank. As soon as I catch a fish, I’ll mark that spot as a waypoint on my Garmin fish finder to return later and usually catch several more bass. When bass in one school quits biting, I’ll fish until I pinpoint another school, catch some bass out of it and mark that location as a waypoint. • The Florence Harbor Marina. When I leave the riprap, I’ll head to the Florence Harbor Marina, still casting an Alabama Rig around docks. Generally, bass will be holding on the outside ends of boat docks and not schooled up as they’ve been on the riprap and at the lock. I’ll catch single, 3- to 5-pound bass in this area. • Downstream from the marina on main-river points and points of islands. Once I come out of the marina, I’ll head downriver and begin fishing main-river points, often the ends of underwater bluffs in 25 to 30 feet of water. I like to start fishing about 75 yards below a point and fish down and around the rock bluffs for suspended bass. I’ll also target fishing points of islands as I move downriver, especially where the river channel swings close to the end of an island. 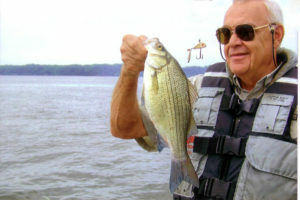 When you’re fishing Pickwick in December, Paul Elias says you’ll probably catch a number of white bass and other fish. Bass at Pickwick will school tightly in December. If you catch bass on one of the bluff points or the deeper points around the islands, you should catch good numbers of bass. Schooling surface bass. Bass will also be schooling on the surface the first couple of weeks in December, depending on the water’s temperature. However, if the last two weeks of December are fairly cold, you won’t see any surface bass busting shad. At each of the places where I fish an Alabama rig, I also will fish a hard Megabass jerkbait in chrome/purple back/chartreuse belly on 15-pound White Peacock fluorocarbon with a 6-foot-10 Expride rod and a Curado 7.5:1 reel. December smallmouths particularly like this jerkbait. I’ll also fish topwater lures, especially in early December, on the ends of islands and grass beds and over the tops of submerged grass beds. I’ll fish a Zara Spook on 30-pound braid with a 6-foot-10 Expride rod and a 7.2:1 Curado reel, and a bone-colored Whopper Plopper fished on same line and Curado reel with a 7-foot-2, medium-heavy Expride rod. Electronics will tell you where the bass are holding. Look for balls of baitfish in15 to 25 feet of water; bass generally will be schooled up under or off the sides of the balls of bait. A piece of equipment that’s been very useful for me is Panoptix Live Scope, which gives me the ability to see all around my boat in real time and in three dimensions. By rotating the transducer on my trolling motor, I can see the fish I’m trying to catch, although I can’t tell what kind of fish are in the school I’m seeing. I like a 12-inch and/or 8-inch Garmin chartplotter/sonar combo model on the front of my boat. Generally, you can catch bass at Pickwick all-day long during the first two weeks of December.